Land of Lisp became one of my favorite Lisp, and programming, books. The main reason is how different the book is. The cartoons and the jokes are a major part of that but what really makes the book great, is how Conrad Barski connects the fun side to the actual content. And in this aspect, teaching and presenting Lisp through simple games is a key to that link. The pieces just fall into place. And the selection of games, characters, etc, is for the most part well done making you feel that you are in a conversation with the Wizard himself. That’s perhaps the best description of what it feels like reading the book: you’re the apprentice that is next to the Wizard and he just shows you, step by step, all those wonderful spells in a very convincing way. What about the content itself? How is the book and how does it relate to other Lisp books, specifically the ones aiming for beginners? What does it present? Well, I think a lot can be said about all that. In my opinion, the introduction is one of the best chapters in the book. The history section is one of the most original texts I’ve read in a computer-related book. The first steps with Lisp are also well accomplished since I think it will be very easy for a beginner to surpass all those initial non-issues (which Lisp? what implementation, etc.) and at the same time understand why things are the way they are. Although I don’t use CLisp, I don’t think it was a bad decision to use it as the implementation for the book. It’s more than fine for learning and allows the book to explore certain areas that otherwise would not be possible in an agnostic manner (e.g., sockets). Unless libraries were used, but I don’t think that would be good in an entry-level book like this. The approach to teach Lisp in LoL is mostly a functional one. From the first chapters the concepts are presented with the functional style always in mind. To be honest, I don’t think this is a bad approach but it has some drawbacks. It’s easy to show a lot of things and explain others but fails in showing how Common Lisp really excels. Chapter 5, building a text-based game, is a good example of how a functional style works well. However, this does not mean the more imperative, non-functional aspects, are “hidden” or held-back. It’s quite the opposite. The initial chapters, and specifically chapter 2, show how to declare variables and assign values. It also shows a lot of “with effects” stuff. The genius of the author is precisely in how he puts all these concepts together. In the end, the user feels the advantages of the functional aspects and at the same time sees lots of familiar stuff. Along the way we find some gems. One is chapter 6.5, about lambda. Another is the “Periodic Table of the Loop Macro” in pages 200 and 201. This is the most innovate way I’ve seen to clearly present loop. I wish a poster would be made out of those two pages. I never liked Chemistry so much but I love this periodic table. The very last gem is surely the last cartoon explaining the main Lisp features (this cartoon is available at the website). Conrad Barski is able to present the main topics of Common Lisp. On top of that, he leaves the comfort zone and shows how to use Lisp for “real stuff”, more practical, even in the form of a game. You get to see how to produce graphviz files, how to do web development, play with SVG files among other things. I also liked very much how macros are used to introduce Lazy evaluation and how a faster version of the Dice of Doom game is developed. FYI: the acronym “LoL” has been used (for some time) for the Lisp book Let Over Lambda. I have to admit, that when I read the book, I was initially distracted by the illustrations, but it turned out well when I placed myself in the seat of the target audience. The author of the book does not emphasize on any particular Lisp style, instead he presented Common Lisp in a manner that would hopefully appeal to people with prior programming experience, but wasn’t able to appreciate the language. It may just be me, but having a lot of state-oriented code feels, in a way, uncomfortable. Some of the code contained in the book also felt like they were translations from their imperative versions. It may also be worth mentioning that mutations are scattered around. Nevertheless, for people who wants to try Common Lisp but are too intimidated, this book may ease the discomfort. It makes a lot of use of visualizations and illustrations to alleviate the usual pains in appreciating Lisp. Another good book to read alongside Land of Lisp, is the book Common Lisp A Gentle Introduction to Symbolic Computation by David Touretzky. 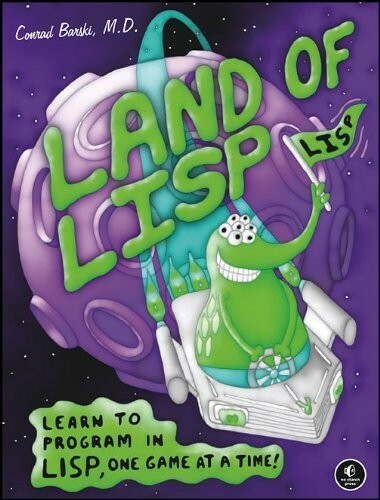 It contains many points that Land of Lisp may have missed.